Welcome to the Benedict College Marching Band of Distinction Alumni Club store. Here you can purchase items that are for sale via fundraiser and also pay your annual Alumni Dues. We thank you for supporting the Benedict College Marching Band Alumni Club. 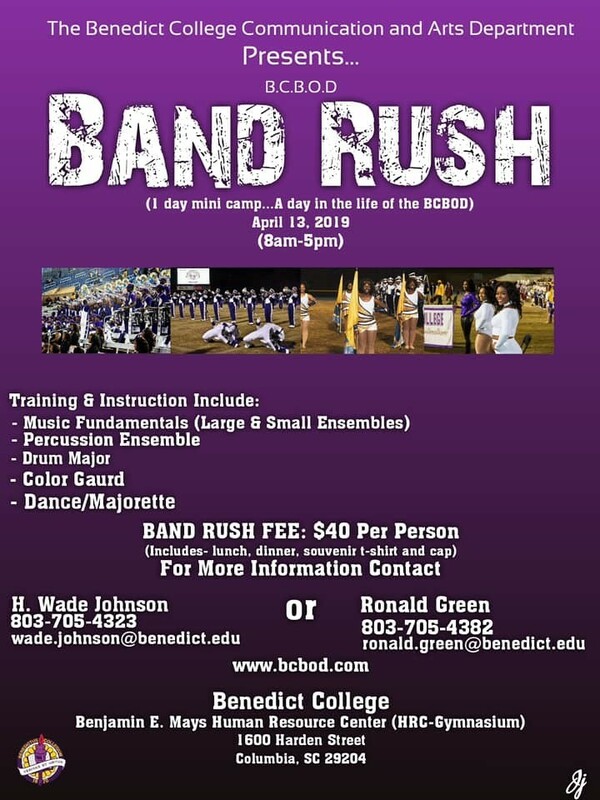 The Inaugural Benedict College “Band of Distinction” BAND RUSH!!! Featuring Middle & High School students (grades 8-12) from across the country. This will be a day filled with Musical and Auxiliary instruction from the Band Staff and Members of the BCBOD, ending with a culminating performance. Come ready to LEARN, SHARE and HAVE FUN!!! Along with your payment you must complete REGISTRATION FORM to finalize your registration.  To strengthen and extend relationships among the alumni and friends of the Benedict College marching band program.  To increase the visibility and enhance the image of the Benedict College marching band alumni. To assist the Benedict College marching band program in its recruitment efforts.  To provide financial support to the Benedict College marching band program. Dues are $50. All dues are due at the time of application submission, both are required together. bcbodalum@gmail.com or call Bobby Rogers 803-851- 1520.